When I was very young, my father had to take a job in far off Louisiana to help support our family. To put off the parting a few more days, the family drove together down south. I have no memory of how we got back…if we flew or if my mother drove us alone. I know he stayed there and we went back to New Jersey. What I also remember was the radio playing in the car, ominous warnings of a hurricane about to hit. 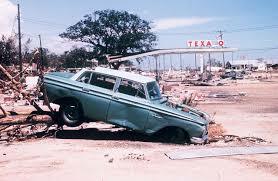 The name of the hurricane began with a C – Hurricane Camille. I remember a wall of rain suddenly hitting the car. One second it was sunny, the next it was pouring rain and completely cloudy. My parents decided to hang a right and try to avoid the eye of the hurricane, which was set to crash into New Orleans (our actual destination). My father headed a bit north and so did the hurricane. The eye hit where we were – a small town called Slidell (which would, by the time the hurricane passed, record the highest rainfall amounts). By the time it made landfall, Camille was a Category 5. 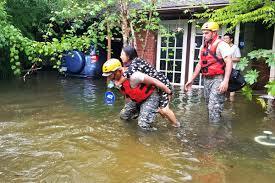 Between the storm and the flooding, almost 300 people died; almost 9,000 were injured and more than 20,000 homes were destroyed or severely damaged. We sheltered the storm in one hotel room – all five of us and our dog. In the morning, people stumbled out in shock. People still remember Camille. I was 8 years old. I still remember Camille. People are going to remember Harvey too. The pictures, the devastation – it’s horrible. I remember the wind; the sound of things crashing. I remember the hotel carpet being soaked all the way through the room. I remember the power going out and being afraid to go to the bathroom. My father carried me to there and stayed and then took my sister as well. I don’t know if I knew who the President was back then or if he flew to New Orleans to see the damage. I don’t remember who the first lady was and most important, I don’t remember what she was wearing. I remember the howling. I remember seeing the damage to our relatively new car; I remember watching lines of cars wait to drive past the huge motel sign that had snapped in half and was still swinging with the wind. You had to time your exit from the parking lot just right to avoid getting sideswiped by the sign. And I have no idea what color or what type of shoes the first lady was wearing as we made our escape from the motel parking lot and drove past the devastation into New Orleans. And now for something that seems not to be connected…I’ll tell you something else. I like Melania Trump. I like her because people in her native country still remember her. They say she was ambitious and beautiful and smart. They also say she was kind. She speaks six languages and has set Betty Ford and Jackie Kennedy as her role models (as compared to the unimpressive Michelle Obama and Hillary Clinton as first ladies). I like Melania because she has one of the hardest jobs in the world…and she does it with grace and beauty. Not everyone is born beautiful. Melania was. She took advantage of her beauty and there’s nothing wrong with that. She is a devoted mother and she’s probably a better wife than Donald Trump deserves. What’s the connection between Hurricane Camille and Melania Trump? Well, not much but having lived through one of the worst hurricanes ever to hit the United States, I can imagine what the people of Houston are feeling. But really, only a fraction. It was our hotel room that took a battering; not our home. It was our car that was damaged, not our lives. The next morning, with wet clothes and soggy shoes, we were able to get in our car and drive away from Slidell. What’s on my mind is Houston and Hurricane Harvey. So what’s the connection between Harvey and Melania? The answer is heels. But before I get there, let me introduce one more thing – Hakarat Hatov. It’s a Hebrew term that has an incredible concept behind it. The literal meaning is “recognizing the good.” It’s the idea that you look for the good in the actions of others. You assume good intentions, but perhaps more important you recognize the good in everything. So now, let’s talk about Harvey and heels. At least 30 people have died in Hurricane Harvey. Almost 300,000 people lost power. At one point, I saw a report that said areas of Houston were under more than 15 feet of water. And the big news? Apparently when Melania chose to accompany her husband to pay a visit to Houston, she wore high heels. Can you imagine? Oh. My. God. Right? If all you can focus on are the heels on Melania’s shoes, that says more about you than it does about her and instead of looking down on Melania, perhaps you should look up to her. She visited the victims…what did you do? 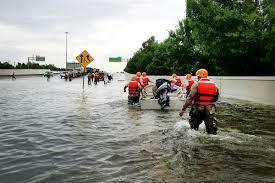 Not only did you do nothing for Houston, you even failed one of the most basic principles of Judaism – Hakarat Hatov….